Grasshopper bills itself as “The #1 choice of top entrepreneurs,” and that wording is quite deliberate. 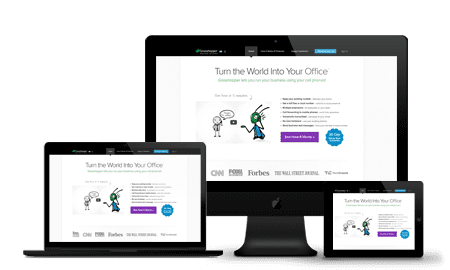 This is a system designed for startups and very small businesses that want to set up a professional system with as little disruption as possible. Rather than a true VoIP PBX system that’s intended to replace your office landline phone system, Grasshopper is a virtual PBX. It’s designed to provide a professional image for your business, with company and extension greetings, custom call forwarding, hold music, and unlimited department and employee extensions, all sitting behind a toll-free or local number. It requires no new hardware, with calls routed to your team’s existing landline or mobile phones. This plan is best suited for the growing business with 1-3 employees. None of the plans require anything more than a 1-month commitment, and all offer free activation and unlimited extensions. Grasshopper offers unlimited extensions with all of its plans. Each extension can be easily customized to fit your business’s needs. Grasshopper is designed to give your small business a professional image at a minimal cost. The option to have all of your phone greeting messages recorded by the company’s professional recording studio is a great way to achieve the appearance of a big company on a small budget. All of Grasshopper’s plans come with at least one free business number. You can choose between a local number (this can be anywhere in the US or Canada) or a toll-free number (800, 844, 855, 866, 877). You can also choose to keep your existing local or toll-free number. With this feature, an incoming call can be configured to ring on multiple devices at once, enabling a group of employees to answer the call simultaneously – whoever gets it first. This strategy is effective for customer support groups that handle similar queries, when it is important to be swift and efficient so as not to keep the customer waiting. Users can configure the system to forward incoming calls to another device – be it a mobile phone, PC or stationary IP phone – or transfer calls to another line. The first is especially effective when you’re outside of the office but want to answer all incoming calls. The second option can be used internally, to quickly navigate calls to the corresponding departments and improve the service quality. Call screening – Evaluate the characteristics of a telephone call – caller ID, location, the time and date – before deciding how or whether to answer it. Inbound fax to email – A fax number that forwards incoming faxes to your email address. iOS and Android apps – access the VoIP system on the go. Voicemail transcribed to email – Forward incoming voicemails to emails and read them. Business SMS – Allows users to send and receive text messages on their business number instead of personal number. Unlike a full-fat PBX/VoIP system, Grasshopper is genuinely quick to set up. You simply pick your plan from the four available, choose a local or toll-free number (or elect to port an existing number), and fill out your payment details. Once that’s done it’s just a case of setting up your extensions and other settings and away you go. Grasshopper offers a variety of resources to help their users. These include a knowledge base, how-to guides with pictures, and several helpful videos on their YouTube channel. Users can contact the support team via a toll-free number available 24/7 or a toll-free fax number. While there is a link on the website to contact Support via email, the link leads to the support page and does not give an actual email address. Customers have mostly been satisfied with the overall level of customer service from representatives. There is 24/7 support available. Email support is available 24/7. A FAQ page is available. Grasshopper has a blog with tips, news, how-to guides, strategies, and more. Having been one of the market leaders in VoIP services since their inception in 1996, Grasshopper has ample experience and a strong market share that has made it possible for them to create a wide range of plans that can be tailored for the specific needs of each company. Hi totally new at this! So, laymans terms please? It was suggested I choose this service for my “about to open” online retail store to acquire a 1800 # for my shop. So… exactly how does this work? I don’t have a cell, just a landline. Do I need special equipment? We suggest contacting Grasshopper to see if your current landline phone is compatible with their service. Otherwise, you have the option of installing their desktop equipment on location. Yes of course! With Grasshopper, you can bring your own phone, like a mobile phone, or opt for a desktop phone. The choice is yours.